If you are looking for someone to tell you the right motorcycle to buy, you've come to the wrong place. I don't know what bike will be the right one for you. You won't know which bike suits you until you start trying them out. But there are some trends you can look at to see which motorcycles are popular with women. That will give you a place to start. One of the most popular models of motorcycle that women are riding today is the Harley Davidson Sportster. The sportster comes in several different models, but all of these bikes are narrow and nimble. They were designed for flat track racing, but they've been taken to the open road in grade Harley style. These bikes have a low seat height, which is one reason they are attractive to women. The 2009 XL Sportster 883 Low has a seat height of only 25.3 inches. The engines are either rubber mounted 883cc or 1200cc. These are high performance bikes offering a great ride. 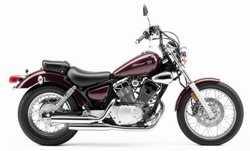 The Honda Shadow 750 Spirit is a classic cruiser bike with a sporty attitude. This bike has a 750 v-twin and long, lean lines. The seat height is 25.7 inches. It's got a 3-valve dual plug combustion chamber and some unique custom drag bike features. This bike is not a sport bike, but it definitely has some get up and go. It's got classic styling and we love it! The seat height in this Yamaha model is just .5 inches lower than the Honda Shadow, coming in at 25.2 inches high. It's a peppy bike with some solid acceleration. Again, it's not a sport bike, but it's got a sport attitude. With about 50 horsepower pushing it, the bike cruises well. It handles having a passenger on board with ease. Although quite similar in some ways to the Honda Shadow, it's still a unique bike. These three bikes are a great place to begin looking if you are searching for a bike. Keep in mind a couple of things. First, beauty is in the eye of the beholder. What you think is beautiful in a bike might not look so good to someone else. Trust your instincts and choose a bike that looks the way you want it to look. Second, the bike's got to fit you. It doesn't matter if it fits someone your approximate height and weight, it's got to fit you. The only way to see if a bike fits is to sit on it. And sit on the next one. See which one feels the best. Believe me, after you've been on the road for a few hours, it's not going to matter what the bike looks like. It's going to matter how you feel sitting on it! Just because these are the most popular choices of bikes women ride doesn't mean these are the bikes for you. Look around. Ask questions. Try out lots of bikes. And remember, buying a bike doesn't mean you're committed forever. Many, many women buy a used bike the first time around. Buying used saves you money, and it frees you up to change your mind more quickly. Depending on how much you ride, you might find that your skill level increases very quickly and that you will want a more sophisticated bike soon. Don't be afraid to go used and trade up.